Seattle City Councilwoman Jean Godden is looking out for you. Never mind any of the campaign slogans, platitudes about how she’ll improve the city, none of that. 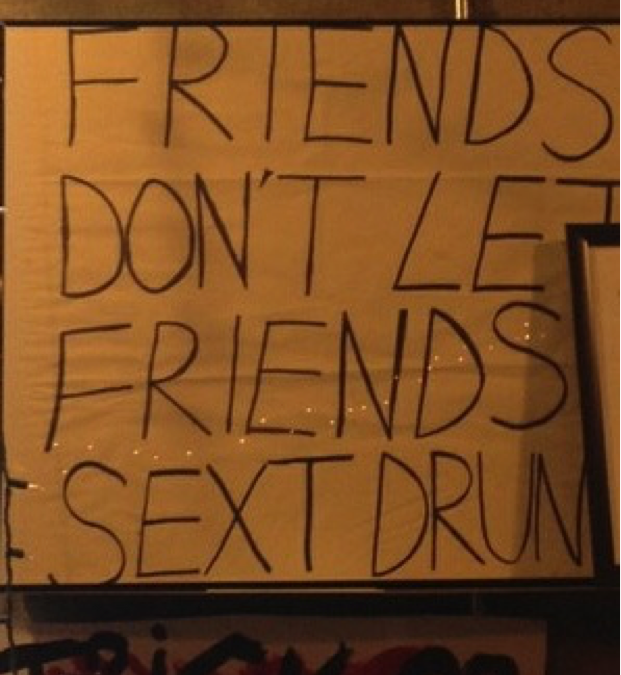 You know that, deep down, she truly cares about you, because she doesn’t want you to sext drunk. This sign’s sage wisdom dates back to Godden’s talent act from July 28, 2011, during the second biannual Washington Bus Candidate Survivor. In case you haven’t heard, Candidate Survivor combines a hard-hitting interrogation, a serious political forum, and a Japanese game show to create one of the most innovative, smartest, and most fun events in Seattle politics. As badass Bus Program Director and Candidate Survivor 2011 attendee Alex Miller explained, this sign is a perfect example of the humanizing power of Candidate Survivor. It’s not about tightly crafted PR soundbites or quippy slogans, it’s about how the politicians we elect are actually people too. They rap really badly (Tim Burgess). They skinny dip in Lake Washington (Peter Steinbrueck). They juggle (Mike McGinn). And yes, they give sexting advice. Politicians: they’re just like us! This gem of a sign graces our office walls because, as Miller put it, it’s something that “needs to be preserved unto time immemorial.” The sign is pretty hilarious on its own, but when you put it in context – an 80-year-old elected official giving sexting advice to a bunch of twentysomethings – it’s side-splitting. And the drunk sexting tip wasn’t the only thing Jean Godden had for us. She reminded us all to never send head shots, to never send questionable messages to coworkers, and to never feel shy about using some photoshop. Feel a little better about Seattle politicians? Think Jean Godden should write an advice column? Me too. In the meantime, here’s the everlasting glory of those wise words of wisdom. This blog post was written by 2014 Bus Intern and Hella Bus Content Lead Isabella Fuentes. This is the first post in our series of “Meet the Office” articles on all of the crazy things we’ve collected in our office over the years.